Your brows are more important than you think! They frame and shape your face. And even help you physically (and sometimes unconsciously) express your emotions. Why wouldn’t you want them to look their best? Here’s an easy to follow guide to help you fill in even the most sparse brows. Good brows start with a good shape! Keeping your brows groomed and shaped makes all the difference. Especially when filling them in! Be sure to remove unwanted hairs for a nice, shapely brow. Then, use a brow spoolie to comb hairs into place. This gives your brows a clean shape that’s easy to use as a guide to fill in. Now it’s time to outline your brow shape! Draw a line from the head (beginning) to the tail (end) starting at the base of your brow. Use your natural brow shape as a guide to achieve the best shape for your face. You can use a brow powder, pencil or Pomade. 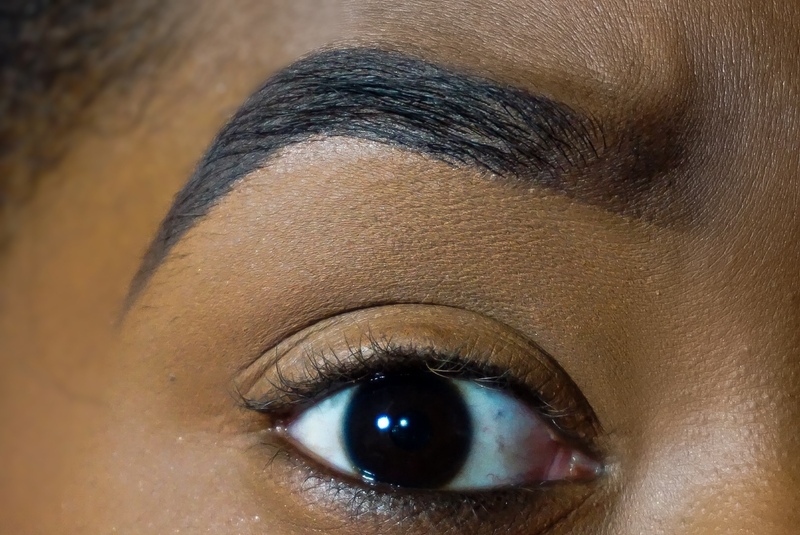 You can skip this step if you have naturally full brows. However, this step is just for you if you’re missing hair towards the head of your brow! Create “hairs” by using short, firm upward strokes. This helps to give your brow a natural full finish without looking blocky or harsh. Next, outline the top of your brows. Simply follow the natural shape of your brow. Be sure to taper the ends towards the tail of your brow for a point. Step Five: Blend It All Together! Use your brow spoolie to blend together your outline and hair strokes. This helps to give your brow shape a more a natural finish to avoid the “drawn on” look. Blending also helps to disperse product to sparse areas. Which means less work and less product to fill in your brows! Now it’s time to color inside those lines! Continue using hair like strokes to fill in the rest of your brow until it looks full with no sparse spots. Or you can use a tinted brow gel (like Milk Makeup Kush Brow Gel). Makeup is all about blending! Blending ensures a natural finish. Which you’ll definitely want when it comes to your brows! Gently run your brow spoolie through your brows to soften any harsh lines. Continue until your brow looks natural. Mistakes happen! It’s easy to make your brows uneven, too long or too thick. Using a concealer helps to clean up those mistakes for a sharp, clean brow. Concealer also helps to hide pesky stray hairs, too. Simply use a concealer that’s one to two shades lighter than your foundation shade under your brow. Be sure to use your foundation or close to your foundation shade when concealing the top of brows. This avoids the unnatural “ring” highlight and keeps everything looking natural. Step Nine: Even More Blending! You have to blend your concealer, too! Use a small, fluffy blending brush, sponge or concealer brush to press concealer into skin. You want a seamless transition between your brows and found. Blending helps to fuse your foundation and concealer shades together seamlessly. You can also use concealer to brighten your eye area and as an eyeshadow base to make colors pop more and last longer. Simply blend your concealer down to your eyelids. Be sure to completely cover eye area from brow to eyelashes. Even the best of concealer formulas crease and fade eventually. You want your brows to look their best all day long. Right? Use a translucent powder to lock your concealer in place all day long. Translucent powder also helps concealer look more natural by getting rid of that wet look. Giving you more of a skin like finish. Now you have a clean, polished brow that’ll look great all day long! ← The Urban Decay Born To Run Palette is Too Good!